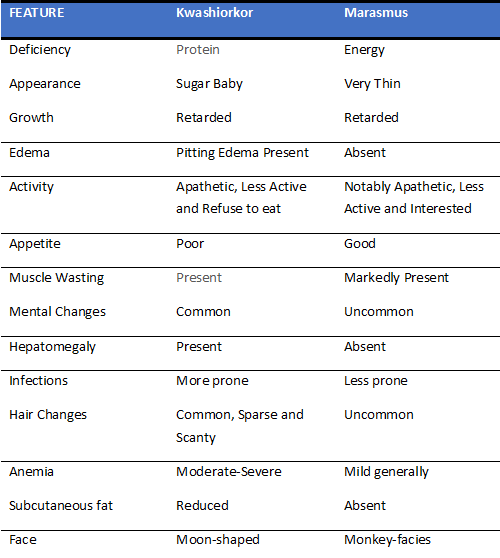 PEM or Protein-Energy Malnutrition is a macro-nutrient deficiency rather than micro-nutrient deficiency. It is actually a combination of two pediatric diseases very commonly encountered, Kwashiorkor and Marasmus. While the Marasmus occurs due to energy deficiency, Kwashiorkor is attributed to protein deficiency, the two being most common in children. Doctors lead to PEM diagnosis based on signs and symptoms, that are usually easy to observe, although laboratory diagnosis is always useful for workup. But what is the question-answer approach we should go to seek the patient? Let’s reveal to these most important questions while revealing more about the Protein-Energy malnutrition types, Kwashiorkor and Marasmus. Because of oedema, patient may look healthy and will have fat SUGAR BABY appearance. Muscle wasting is always present, child is often weak, hypotonic and unable to walk or stand. Skin changes- increased pigmentation or dyspigmentation, enamel spots, petechiae over abdomen and ulcerations. Hair changes- Sparse and easily pluckable. Cardiovascular manifestations- Bradycardia, cold and pale extremities with hypotension. Gastrointestinal changes- Anorexia, vomiting and abdominal distension. Severe wasting of muscles and fat, therefore patient appears very thin and has no fat; severe wasting of shoulders, arms (check arm circumference, green>13.5cm, yellow-<13.5cm and red<11cm). Monkey facies due to loss of buccal pad of fat. Baggy pants appearance due to loose skin of buttocks hanging down. Axillary pad of fat also decreased. No oedema and normal hairs. DOCTOR- How is the appetite of patient? Are there any feeding difficulties? Kwashiorkor presents with loss of appetite (Anorexia) and feeding difficulties, while Marasmus patients usually have good appetite and are not usually difficult to feed. DOCTOR- HOW OFTEN IS THE MOOD OF PATIENT BAD? DOES HE SUFFER IRRITABLE OR UPSET MOOD EPISODES? Kwashiorkor patients are mostly unhappy or irritable with sad and intermittent cry. On the other hand, Marasmus patients are alert and don’t show signs of mental changes. DOCTOR- DOES THE PATIENT VOMIT OFTEN AFTER MEALS? Vomiting after meals or food intake is a sign of Kwashiorkor. QUESTION 1- IS PATIENT THIN OR NORMAL LOOKING? Thin appearing children usually attribute to Marasmus, while healthy looking are Kwashiorkor which is due to edema masking the wasting. QUESTIONS 2- WHAT IS THE ARM CIRCUMFERENCE OF PATIENT IN ANTHROPOMETRY? Green more than 13.5cm, Yellow less than 13.5cm and Red less 11cm. Red and yellow are signs of Marasmus. QUESTION 3- WHAT IS THE APPEARANCE OF FACE, HIPS AND AXILLA? Kwashiorkor presents with moon shaped (healthy) face, normal hips and axilla due to edema, while in Marasmus, there is monkey-like face, bagging of hips and reduced axillary fat. QUESTION 4- ARE THERE SIGNS OF DEHYDRATION? Sunken eyes and poor skin turgor (pinch skin of patient’s hand, lift it up and lose it, wrinkles means poor turgor) are signs of severe dehydration. Management must be done immediately to treat it apart from the cause. QUESTION 5- IS THERE ANY PITTING EDEMA? Pitting edema is generally checked by pressing shin of tibia by finger for 30 seconds and then removing to check if the skin didn’t regain the depth of compression. It occurs in Kwashiorkor. QUESTION 6- WHAT IS THE TEMPERATURE FELT ON EXTREMITIES LIKE HAND AND FEET? Cold extremities are usually signs of cardiovascular manifestations of Kwashiorkor. One must deal with them STAT. QUESTION 7- IS THERE ANY FEVER? Kwashiorkor patients are more prone to developing infections than Marasmus, however that doesn’t mean Marasmus patients are not going to develop fever. Infections should be treated by antibiotics and prevention is always a better option. QUESTION 8- WHAT ABOUT RADIAL PULSE? Kwashiorkor patients present with Bradycardia while weak and rapid pulses are observed in Marasmus. QUESTION 9- IS THERE ANY ABDOMINAL DISTENSION? Abdominal distension is again a sign of Kwashiorkor. QUESTION 10- IS THERE ANY HEPATOMEGALY? Hepatomegaly again attributes to Kwashiorkor. QUESTION 11- IS THERE ANY ANAEMIA? Both Kwashiorkor and Marasmus can present with anemia, however, very severe anemia can sometimes hint towards Kwashiorkor.